Safari With Us has created this safari experience for the adventurous traveler. During this safari, you can enjoy some of South Africa’s finest wildlife spots at an affordable rate. Enjoy open vehicle game drives in Kruger National Park, bush walks, sunset drives, and more. Experience a safari crafted to provide you with a rich, exciting, and unforgettable experience. The shuttle will either pick you up from your hotel or guesthouse in Gauteng or from O. R. Tambo International Airport (JNB). Pickup time is between 8.30 am and 9.30 am. You will then travel via farmlands to the picturesque low veld and on to a game lodge in the Balule private game reserve in Greater Kruger. Lunch stop on the way. After a short break, during which you may unwind at the bar, have a swim, or relax in the tropical gardens, you will board the open Landcruiser for a three-hour sunset wild life game drive. Your guide will show you various animals and birds and after darkness falls, you will use spotlights to locate nocturnal species. Dinner will be an unforgettable bush braai (barbecue) at the Marula Tree Boma. After dinner, you will continue the night drive on the way back to the lodge. You will stay overnight in a comfortable air-conditioned en suite thatch-roofed chalet. Awaken at sunrise for an exhilarating day in the bush! You will drive to a remote part of the Balule Game Reserve, where you will enjoy a four-hour bush walk with an armed ranger. Your experienced field guide will lead you through the bush. The thrill of following Africa’s large animals until you can take a photo will remain with you forever. Adrenalin surges will be acute, notwithstanding the presence of your armed ranger. You will return to the bush lodge for brunch. At around 2:30 p.m., you will go on an afternoon game drive. Afterward, you will be transferred to the tree house camp where you will have an overnight stay in one of the rustic tree houses. You will drive to the Orpen area in Kruger National Park where you will enjoy a full day of exciting game viewing. The absence of windows and elevated vantage position allow for excellent photographic opportunities. You will have an amazing chance not only to view game, but also to listen to and smell the African bush and its denizens. There will be regular stops at picnic spots and rest camps. Your experienced ranger will show you many animals and birds that frequent this wildlife paradise. The Orpen-Satara region in Kruger boasts open plains and supports large herds of zebra, giraffe, and antelope, which in turn attract numerous predators. In fact, the zones you will visit have the highest concentration of lions in Africa! After an early morning cup of coffee or tea, you will enjoy an early morning nature walk accompanied by your guide. After a wholesome breakfast, you will drive to the awesome Three Rondawels and the Blyde River Canyon. This is the third largest canyon in the world and you will have time to take photos from various viewing points. Afterward, you will drive to the quaint town of Dullstroom where you can enjoy lunch. You will return to Johannesburg in the Gauteng province in the late afternoon. Drop off by arrangement is between 4:00 pm and 5.00 pm. 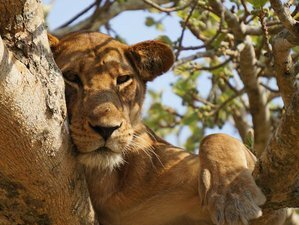 The Kruger National Park is located in the lowveld in the north-eastern region of South Africa and spans across two provinces, the Mpumalanga and Limpopo provinces. It is not only the largest national game reserve in South Africa but the most prestigious and impressive. This world-renowned park, which occupies an area of about two million hectares or 20,000 square kilometers, is home to a large variety of fauna and flora. The Kruger Park, which boasts of the richest assortment of life forms in Southern Africa, offers one of the best safari and game viewing experiences. The park is about 360 kilometers long from north to south, about 65 kilometers wide from east to west, and about the same size as Wales. The Kruger, formerly proclaimed a national park in 1926, forms part of the Great Limpopo Frontier Park. This massive peace park links the Kruger with the Gonarezhou National Park in Zimbabwe and with the Limpopo National Park in Mozambique. Zimbabwe lies to the north and Mozambique to the east of the Kruger Park. The Kruger Park, which is famous for its abundant wildlife, is also a world leader in advanced environmental management techniques. Several rivers flow through the Kruger in an easterly direction, including the Sabie, Olifants, Crocodile, Letaba, Luvuvhu, and Limpopo Rivers. You will be provided with daily breakfast and dinner. Please book your flight to arrive at O. R. Tambo International Airport (JNB). Transfer from and to the airport is included. Safari With Us will pick you up from the airport.